For a good selection of these representations, try The Web Gallery of Art, noting particularly the Bouts, the Duccio, and the Huguet, which are closest to Browne's particular description. (The Huguet has an added, rather disturbing note: Judas has a cat under his robe. Compare this to the altar seen below. In this Italian Romanesque representation, from Volterra, where Judas is creeping about under the table with a devil in hot pursuit at the very moment that Jesus is handing him the sop.) 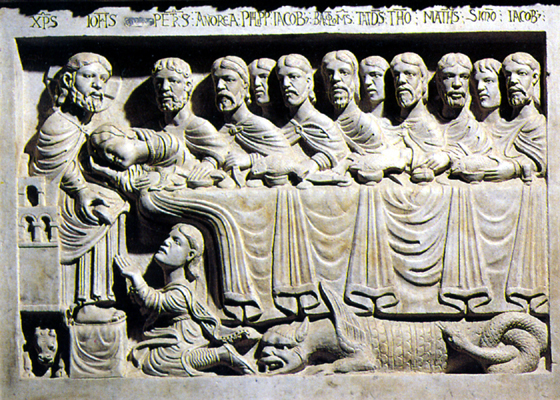 The most famous of these representations (currently) is of course the Leonardo Last Supper.